Surf-and-turf titan Michael Mina, raised among the dairy farms and sheep pastures of rural Washington state, tends to an empire of 19 restaurant and lounge concepts from Vegas to Baltimore. His Mina Group was cofounded with tennis champ Andre Agassi. He has cooked for three US presidents, written one eponymous cookbook and founded Cook Taste Eat—a digital media firm that produces culinary video content. The chef talked with Food & Wine about mysterious spice blends and dirt bikes. Probably my lobster potpie. It’s a two-pound lobster that is done in a brandy cream sauce with a little bit of truffle when they are in season. It all goes into a pot with puff pastry over the top, and then it’s baked in the oven. Then we bring it into the dining room and carve it at the table. It’s very theatrical and it releases a lot of aroma in the room. My tuna tartare exemplifies my approach: a balance of acidity, sweetness and richness, and an emphasis on global ingredients. This dish is made with tuna, pears, pine nuts, Scotch bonnet peppers and sesame oil, so it really has that global sensibility. The restaurant Michael Mina has always been known for its trios: taking one main product and doing three variations on it. The striped bass trio we do at Michael Mina at the Bellagio is particularly good. It’s tapioca-crusted fish served with three accompaniments: forbidden rice and a citrus reduction; basmati rice with curry and dried fruits; and a crispy rice cake with a dashi jus. Who are your food mentors? What are the most important things you learned from them? I have a few mentors. Gerry Hayden taught me about pastry and how it connected to savory food. I learned a lot about balancing flavors from him. Then George Morrone taught me how to really understand and cook for the guests. He told me that you need to learn how to wow people in different ways. You might wow one guy by showing him the time that you put into cooking a steak. You’ll wow someone else with four different preparations of the same animal. But the point is to wow them all, as much as you can. And then of course Charlie Palmer. He taught me about how to have presence as a chef, and opened my eyes to the notion of design in a restaurant. As a guest, you don’t just keep your eyes on your plate. There’s more to a great restaurant than that. My father used to go get us salmon at the markets in Seattle, and my mom would cook it forever. You’d need a hammer and a chisel to eat it. One time we were cooking salmon, and she asked me to check on it. When I took it out a piece of fish flaked off that hadn’t been cooked all the way through yet. I ate it, and I thought “Oh, God. This is really good!” I served it like that with lemon and rice. Everybody loved it except my dad—he said it was undercooked. People need to learn how to taste. You watch people cook at home, and they’re so panicked. They’re not tasting and they don’t know what they’re tasting for. Let’s say you’re supposed to squeeze a lemon into something. Well, depending on what time of year it is, and what type of lemon it is, the citrus will have a completely different acid-to-sweet ratio. You need to check in with your food as you go or there’s no way you’ll ever become a great cook. I would love to be able to cut fish like Masa Takayama. I’ve sat there and watched him cut the sinew out of the toro perfectly. It’s mind-blowing, because when you watch it you actually can convince yourself that you can grab a knife and do it too. I would love to have that skill in my repertoire. Rao’s tomato sauce is very good for a jarred product, and they have a lot of different flavors. I’ll get the marinara and then doctor it, depending on what I’m using it for—from red sauce for meatballs to a cioppino base. You’re planning a budget-friendly food trip—where would you go and why? I would say Peru. Peruvian food is right up my alley—fresh, with high acid, sweetness and spice—and it’s very affordable. I bought a spice mix from a guy in a Lebanese market. I couldn’t tell you what was in it, there were probably 60 ingredients in there. I brought back six pounds of it and when I ran out I tried for three years to get in contact with him to get it again. I even took it to Le Sanctuaire, which is a big spice company out here, to try to get them to replicate it. If you were going to take Mario Batali out to eat, where would you bring him? 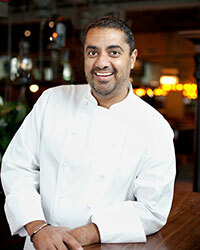 In San Francisco, I would take him to Aziza from Mourad Lahlou, a really terrific Moroccan chef. He blows your mind because his food is so refined, very artful and executed with great technique, but it still has the soul of his country coming through. I would have to say El Bulli: 1998–2002. Flipping through those pages is so powerful, and in a strange way that book dated all food that came before it. It’s one of those books where you pick it up and four hours later you haven’t even gotten through 40 pages. I love motocross, both two-wheelers and four-wheelers. I live out in the country and there are tons of trails and tracks, it’s very cool. You have to be extremely focused to ride dirt bikes. I have a two-wheel Honda CR250 that I love. It’s light but extremely powerful. I’m a big guy, and I can really throw it around. I follow José Andrés, he’s funny and all over the map. I follow Michael Chiarello and François Payard too. I’m really into sports and the 49ers, so I follow a lot of players like Vernon Davis and Patrick Willis. And I follow Rihanna. She’s amusing as hell.